We want to be frugal, natural, and healthy! Well, here are a few steps we had to make along this homemade, diy journey. 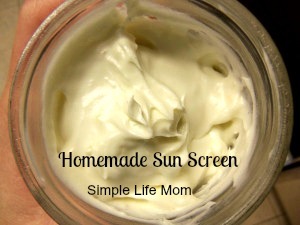 Homemade Natural Sunscreen is a big one! And making these 4 Homemade Natural Sunscreen Recipes is easy! While Octinoxate is almost as bad as oxybenzone, it’s main concern is with estrogen mimicking, causing hormones to be disrupted and wrecking havoc on your system. It has also been found in breast milk. Zinc Oxide and Titanium Dioxide are similar in benefits. They both protect against UV-B and UV-A radiation. icles do cross into the blood stream (4). The study was on nano-titatnium, but we can assume the same possibility with zinc. It is also very dangerous to inhale either metal. Some studies show that cellular damage which can lead to cancer can occur if it is inhaled (Sayes CM, Wahi R). So you can’t inhale it, and you don’t want nano-zinc, but can you use something else? There is Non-Nano Zinc Oxide that you can buy. Here’s a product that we have used: Non-Nano Zinc Oxide. Use – Zinc Oxide must be used only on very healthy skin. When used on skin that is damaged, sunburned, cut or scratched, or otherwise healing skin there is a much greater potential for absorption, which would cause cellular damage. I look at it like this. We are fair enough that the damage from the sun is greater than the danger from these products on a normal day. We believe in getting sun, but not burned (there’s enough skin cancer in my family that I have no problem monitoring exposure). But!!! There are so many other options!!! Read Below! Just say No! Sprays and Powders are a big no no! I can’t get over the ignorance or selfishness of people who sit right beside my family and start spraying. First, four of us will develop extremely itchy hives within hours (we literally have to get up and run). Secondly, inhaling those products is cancerous! Avoid at all costs!! Choose creams unless using an all natural homemade blend. There are natural oils with SPF ranges! These combined can go a long way in protecting your skin. I put on shea butter daily. It is not enough to protect me from getting burned. But I am finding that a combination of the following makes a huge difference. I’ve included links to high quality ingredients. Carrot Seed Essential Oil – approx. SPF 28-40 (contains antioxidants to protect skin cells) Must be diluted or it will burn your skin! Avoid Citrus oils (orange, grapefruit, lemon, etc) as they will increase your skin’s sensitivity to the sun. Everyone’s skin is different. So please use caution when using essential oils and sun exposure until you know how your skin will respond and how often you need to reapply sunscreen. Here’s one study for more information. With the zinc oxide, this will be an SPF of about 40+ (estimate as government hasn’t had their hands on it in a lab to verify). Without the zinc oxide it will be somewhere around 20-30. Measure ingredients carefully, because a little variance makes a big difference in the end fluffiness. Whip raw shea butter until creamy. Slowly add melted coconut oil while whipping. Add essential oils (and zinc oxide if adding – do not inhale!) and whip until fluffy. You can also just create an oil to put on your skin. Combine all ingredients and keep in amber jar (to help preserve oils). Apply over all exposed skin. Reapply often. Instead of a whipped lotion, this creates more of an oil. I like to pour it into a deodorant container and keep in the fridge (to help prevent separation, though not necessary. It can be taken out with you when you go). Use a double broiler or place ingredients in a glass bowl or mason jar in/over water in a saucepan. Add avocado oil, coconut oil, and beeswax to container. Stir on low heat until all ingredients are melted. Remove from heat and add shea butter and essential oils. Stir until shea is melted (do not add before or heat will make shea grainy). If you are adding zinc oxide, add now and whisk until there are no clumps. Transfer to storage container and use as you would your regular sunscreen. Add all ingredients to a sprayer bottle. Shake before each use. 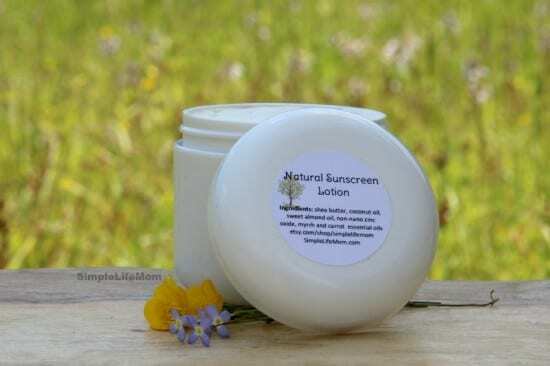 If you don’t have the ingredients or want to give it a try before buying the ingredients, I sell three versions of sunscreen in my Etsy Shop. Thanks Chelsea. I hope you enjoy them. Only by chance when I was on Pinterest I eventually got to your website. Just made the sheabutter one, it’s so fluffy! I changed your recipe a bit and did 5 drops each of carrot seed, lavender, frankincense, sea buckthorn and raspberry seed oil. Just put some on my hand to test if my skin is ok with it, so far so good! Wonderful! If you burn easily remember that you should use the non-nano zinc oxide, apply a lot and often. Yeah atm I’ve only used 1 tablespoon as it’s only just started to get sunny. Will be using more once summer starting to kick in and the sun becomes stronger. Again, thanks for the recipe. My skin has been really soft since using this. We love natural sunscreens. Thanks so much for sharing with Adorned From Above’s Link Party. Have a great week. Thanks Shanice. I’ll check it out. Thank you so much for the recipes! We LIVE at the community pool all summer, so I will need to do the waterproof ones. I also bought my younger daughter several surfer girl swim shirts and might get one for myself too! Great idea Katie. We need the sun, but not the burn. Thank you so much for sharing! I started fretting the other day about what we were going to do for sunscreen this year because we’ve already had some rather warm days here. I made some with beeswax and I can’t remember what oils, but I wasn’t too crazy about it. Well, I hope you like one of the options here and that they work for your family. Stopping by from co-hosting the Let’s Get Real Bog Hop. I’m really interested in your post. I have an allergy to anything with “SPF” on the label. I don’t know which exact ingredient it is that bothers me; I’ve never been tested. So, I’ve just been wearing long sleeves and mostly staying out of the sun. But, even a sunburn is preferable to the reaction I have. So, I’m really interested in these natural ideas. Thanks so much for your post. I’m pinning it for later. Denise, we have horrible reactions. Red itchy rash that’s like fire with heat. We found out it was the oxybenzone, but the other ingredients aren’t much better. Hi, I have super sensitive skin and suffer from Rosacea. I have been looking at some sun block for my face, but even the ones that are supposed to be for people with Rosacea have so many ingredients that I can’t even pronounce. In any case, I am going to try making my own. My question is where do you purchase zinc oxide. Thanks. There is a link in the post above that will guide you to some non-nano particle zinc oxide. I have very sensitive skin and these oils work wonders so I hope it all works out for you. Stop back and let us know. I’ve long been suspicious of sunscreens. It seems counterintuitive to slather my body in something that would be dangerous to ingest. I agree. I think we forget how much our skin really does absorb. This is advice we ALL need to take, especially me (with my fair skin and family history of skin cancer). Thanks for sharing on Mostly Homemade Mondays. I can’t wait to see what you link up tomorrow! I had no idea those natural products contained SPF! What a good find, I’m bookmarking this so I can try making my own sometime. Hi, I’m so allergic I have begun to make my own body butters, deodorants, etc. The last sunscreen I purchased from my dermatologist was too thick on my naturally beautiful tan complexion :0, leaving a white film everywhere it was applied. Therefore I would like to try your recipe for the Sunscreen Oil, should that be 1/2 cup of avocado oil? Yes, you’re right, 1/2 cup. I hope this works well for you. Thank you! I am so fair skinned that I just avoid the sun most of the time. Being out in the sun without sun screen feels like a countdown to getting burnt, and sun screen has always felt so unhealthy. Thank you for the recipe! I made sure to pin it! Love, love, love that thiese are homemade PINNED to try soon…..thanks so much for sharing. found at totally talented tuesdays. We are featuring this post at this weeks link party. Thanks so much for sharing this post with Adorned From Above’s Link Party. Do you know how long the waterproof version remains waterproof? We spend lots of time in the pool, and it is tough making the kids get out to dry off and reapply. No, the beeswax helps it be “more” waterproof than the others, but it’s not completely water proof. I would still recommend reapplying often. Hi! I am really interested in making my own sunscreen, but have never done it before. I also am pretty new to using essential oils and things like that, so I have some questions. 1-it says the carrot seed oil needs to be diluted. I assume you mean it will be diluted properly (by the coconut oil, avocado oil, etc) when I follow the recipes….is that correct? Or do I need to dilute it first, then use drops of the diluted carrot seed oil in the recipe? 2-I have heard that not all essential oils are safe for kids. I have a 4 year old and a 1 year old. Are all of these sunscreens kid-safe? 3-we live by the beach and swim often, so I want to try the bees wax one since it says it is more water proof. I am a little confused though, since it says it is more of an oil, but can be stored in a deodorant tube. If it is oily, won’t the consistency be a problem for a deodorant tube? If I bring it with me to the beach for reapplying, will it “melt” and create a liquidy, unusable mess? 4-instead of using both avocado oil and coconut oil, can I use all coconut oil? Just curious because I have coconut oil, but not avocado oil….just trying to save a few dollars if possible! What will the effects be? Sorry for asking so many questions….just want to make sure I get it right! Yes, the carrot seed oil will be diluted enough within the recipe. The recipes are kid safe. I use them on my kids. But you should always try some on your or their wrist first to see if they have a reaction since everyone is different. The beeswax recipe does set up nicely to be used in a deodorant container, but it will soften greatly if left in the sun. In that situation, I would just put it in a container that you don’t have to worry about. You can use just coconut oil, as long as you are adding the other essential oils that help protect from burns. Like I said, everyone’s skin is different, so even though these are great natural recipes, reapply often in a beach or water situation so that those little ones don’t get burned. 🙂 We use them with our red headed complexion and it works great, so I hope you enjoy! Thanks for the recipes, Kelly. I’ve been looking for a spray sunscreen forever and finally found it here! 2 questions: your spray recipe calls for aloe juice but the link provided shows aloe gel – will a gel still come out of the spray? also, how much beeswax can be added to the whipped sunscreen version so it’s waterproof but still fluffy? I have used both (whatever is in the house) and both worked well. You can always add more oil if your sprayer can’t handle the thicker mixture. I’m sure you can add melted bees wax to the whipped shea butter version, but it will definitely change the consistency. I would add it before the oil. If you add slightly more oil it will not fluff, so you’d have to play around with it. Worse comes to worst you will end up with something that’s not very fluffy, but can still be spread on. Can I use refined coconut oil for the whipped shea butter sunscreen? It’s what I have on hand. Thanks. You can use it in place of one of the oils, not the shea butter. Make sure it’s at melting point, no hotter. This will change the consistency based on the temperature at the time of use since coconut oil hardens under 76 degrees F.
How long the aloe vera sunscreen spray will last? Essential oils can lose their potency when exposed to light. Keep it in a dark sprayer and out of the Sun and it can last two seasons. After that I would make it fresh. Add 5 drops of rosemary essential oil to help prevent oxidation of the oils. Makes it last longer. Hi, thanks for these healthy and natural recipes of sunscreen. Can I replace avocado oil with a lighter oil, e.g. coconut oil or hemp oil? Thanks. You definitely can replace the oils with other oils. Keep in mind that some oils have a higher natural spf than others. Also, Coconut oil is solid under 76 degrees so this will effect the consistency especially during the winter. I am interested in making the more waterproof one but was wondering which ingredient I would increase to raise the SPF. I generally have to use as high a SPF as I can usually one made for babies like 110 SPF to keep from burning. I’ve tried 30-50 ones and still burn within an hour. My son is the same way. Any suggestions would be appreciated. Thanks so much for your site I love it! I am a newbie to the all natural idea and have been switching everything. I just bought one of your shampoo bars and absolutely love it. It works and smells amazing! You can increase the myrrh up to 40 drops. The carrot seed will be harsher on the skin so I do not recommend increasing it by much. You can also slightly increase the non-nano zinc oxide. I made the Aloe juice sunscreen and the beeswax sunscreen. I love how they turned out. My favorite is the Aloe one, it has a light scent and feel, also it works wonderful! I even got a little tan and no burn which is new to me! Worked great for kiddos too! Thanks so much! 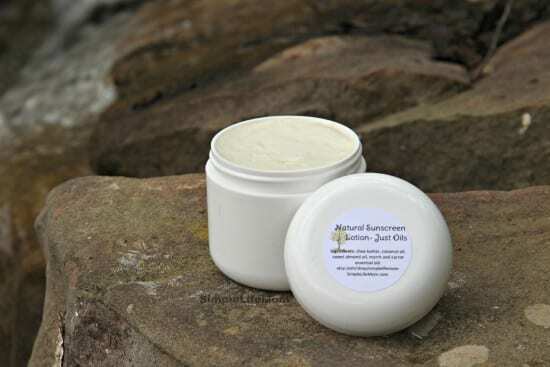 I made the sunscreen oil and more waterproof lotion, which I love so far, so thank you! I was going to make the aloe vera spray and used the link for the gel that you said has no preservatives, however after receiving it, I see that there is potassium sorbate, ascorbic acid, and citric acid, all of which are preservatives. I am disappointed, as the gel was not inexpensive. Have you actually made it with this one, as I want to make sure the preservatives do not interfere with the efficacy of the sunscreen protection? Thank you! Eck, that’s horrible. I have an older bottle someone gave me and it has no preservatives listed. Either they changed their ingredients (which happens often) or they did not have them listed properly then. Thanks for letting me know. I will definitely change the link! The preservative won’t inhibit its effectiveness, they’re just an extra un-wanted ingredient. I’m so sorry to hear about your battle with cancer!! I’ve been doing a lot of reading about the effects of Frankincense on breast and uteran cancer. Let me know if you have any questions about any homemade products. I’m so glad you found us! The Aloe Vera sunscreen.. what is the SPF and what size spray bottle did you use? I cannot say exactly what the SPF would be. I would guess around 25 once everything is diluted. If you want serious coverage, you really need to use the shea butter and/or non-nano zinc oxide recipes. The liquid and aloe recipes are great if you know you’re not going to be in the sun for long periods, but want to give you skin some protection as you go in and out. I use a standard spray bottle that I got Walmart for a dollar or two. It’s about 6 inches tall. LOVED this post! Would you consider putting up a PRINT tab so your subscribers can print some of your stuff easily/easier? T.I.A.! Great idea. The share button with the p above has an email button, but I will look into the print button. Your post is wonderful. Thank you. I am on my early 30s and trying to make sunscreen and face serum myself, for the first time. I already bought other oil but I did not buy Myrrh oil. Can I use different essential oil other than Myrrh oil? I have Borage oil, rose hip oil, and Frankincense oil. Myrrh and carrot are known for protecting and helping skin to heal faster from any sun damage. I would have to do a study as to what element within those essential oils actually performs that action and then see if those are in the other oils that you mentioned. If you want to be protected and not buy more essential oils, I would buy the non-nano zinc oxide. It creates a layer of protection over your skin and is not absorbed. Hi my name is Sonia, I am excited about your range of sunscreens as I am allergic to all commercially made products. I am also allergic to natural products including; aloe vera,beeswax,all coconut and coconut bi-products.I was wandering if your aloe vera sunscreen can be made without the aloe vera and still be an effective sunscreen. I am a tennis coach and currently i can only work at night under lights, its not very convenient for the majority of my clients. Thank you Kelly for your post and i look forward to your reply. I’m a little confused on what you said about the spray. So if we make your recipe of the sunscreen oil, can we put it in the spray bottle? Yes. The oil can be used as a spray or pour. Are these safe for your face and how long is the shelf life? Yes, they are safe for the face. We use them on everyone in ouyr fa!mily. Make sure you test for sensitivity on your wrist first though. Shelf life- I will say 4-6 months is typical for oils like these, but coconut oil lasts a super long time. I have a Shea lotion one made with coconut oil and non nano zinc oxide that’s from last year and still perfect…. I’m interested in using fractionated coconut oil in the aloe vera recipe instead of avocado oil. Does fractionated coconut oil have the same spf as regular coconut oil? I haven’t found any documentation saying the are the same or different in that area, but scientifically speaking, looking at what is changed for the coconut oil to be fractionated, I don’t see why it would change. I can’t say for sure though, sorry. I have a question, after many researches online I did find out that wheatgerm oil has a spf of 20 and sojabean oil a spf of 10 both of these are superior to coconut oil and avocado oil. 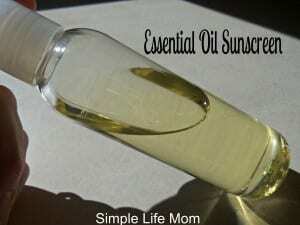 Is there a particular reason you do not increment these oils in your sunscreen recipe? No reason except that I didn’t go into every oil that’s out there. Those are definitely wonderful options! 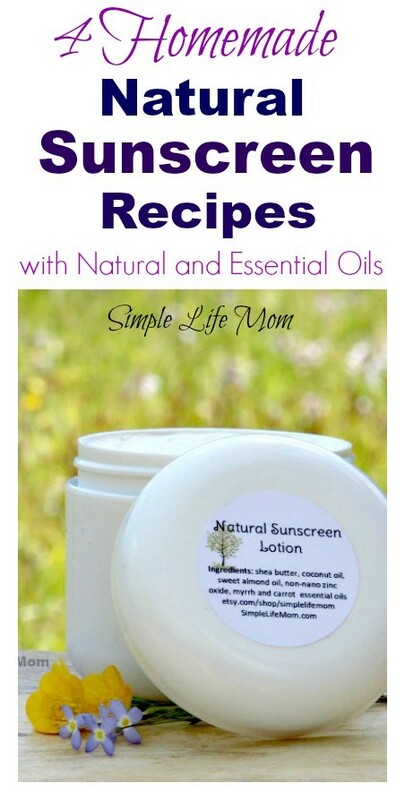 Thanks for sharing your recipes for these great sunscreens. I just made my first batch. I’m curious, how do you add up the spf’s from the different ingredients to know what the general, final spf is? For example, I made your beeswax waterproof lotion that you recommended to put in a deodorant container. With the ranges of spf for each ingredient, how would you come to a general spf for that recipe? Thanks! There’s no way to tell specifically unless you have it tested. We do know that these particular oils have been tested and so they will offer protection, but how much you use, how thick of a layer you put on, etc. will all change those factors. I made the whipped shea butter sunscreen, and there’s nothing “whipped” about it. It’s just liquid. I poured in the coconut oil slowly…’maybe’ not slow enough?? What can I do? I used 1/3 cup of the coconut oil….and 4 oz of shea butter. The shea butter whipped up just fine. As soon as I poured the oil in it just turned to liquid. Was it too hot? Maybe I shouldn’t have melted it on the stove? Yes, once you melt it, it’s very hard to get it to fluff. Blending 1/2 cup raw and cool shea butter and 1/3 cup oil will make a nice fluffy lotion, but melted shea with oil will not whip as well. You can put it in the fridge until it is solid and then try to whip it again. Thanks! I did not melt the shea butter, I whipped it like the recipe said and then added the melted coconut oil. It all turned to liquid after I added the coconut oil. It did harden up in the fridge and I just scoop up a chunk and it goes on pretty easily. However, my daughter gets terribly sunburned using it. Does it just completely wash off in the pool? You do not have to refrigerate it. It keeps for 4-6 months, depending on how sterile you keep it as you use it. What do you use as a whipper for the Whipped Shea Butter Sunscreen? I use a hand mixer, but you can also use a stand mixer. Hi. I recently made another recipe and am looking for something less greasy and that actually works. Three of my family members got burned using. The recipe was 10 drops lavender, 1 tbsp pomegranate oil, 3/4 c coconut oil, 2 tbsp zinc and 2 tbsp shea butter. Heat all but zinc in jar in simmering water and then stir in zinc. It’s too liquidy and too greasy. What would you recommend from your recipes, or to fix? Thank you so much! I would recommend the whipped shea lotion with the non nano zinc oxide (not super fine). You may find it greasy as well though. Most natural oils and lotions are but they soak in quickly. It just depends on how much you want to be natural I guess and a Mayer of making that adjustment. If you got burned before, you can increase the zinc oxide slightly, but too much will leave your skin white. Lavender won’t really do anything for the sun. If you put in one essential oil, I recommend myrrh. Reapply often. I am very fair skinned and was just out in the sun all day and reapplied once and wasn’t burned, so it is effective. I also move toward the shade when I’m out all day like that too. Good luck. I hope I helped. Thank you! I will try that. One question on that recipe. Could I substitute grapeseed oil for the coconut oil? I read that it’s less greasy than coconut. Or since the coconut oil starts in solid form and needs to be melted; and the grapeseed is in liquid oil form (add to whipped shea without warming? ), would that affect the consistency? Both have a low spf, hemp or avocado have slightly higher natural spf. I’m not sure about the greasy feeling. I have them all, but I’ve never really paid attention to that (something I know I’m going to do now just to figure out, lol!). You would need to warm the coconut oil slightly to liquify, but don’t use it hot. Whip the shea really well before adding anything to it at all so that you don’t have lumps, and then slowly add the oil. The shea and carrot seed oil or myrrh are what are giving you the most protection as they help to create a protective layer. Thanks again! I will try this after I get back from vacation (wish I had all the ingredients before hand since we will be in the sun all week!) Looking forward to trying this out. This is so awesome! Going to try some of these recipes ASAP. I am new to essential oils and diy; only done some small projects. Now, I wonder if I could make a sunscreen + insect repellent combo with one of these recipes. I need both since 1) I walk everywhere in blazing hot Miami, and 2) zika is striking. I have read that lavender blends well with carrot seed oil, but I’m not sure about myrrh. And what about citronella, eucalyptus, and/or lemongrass? Do you have any ideas on how to blend these ideas? When you make the shea butter lotion, add the non-nano zinc oxide and then add 5 drops each of citronella and cinnamon leaf (not bark), and 2 drops of lemongrass and myrrh. If you want to leave the zinc oxide out, increase the myrrh to 5 drops and add 5 drops carrot seed. Thanks! Could i leave the cinnamon leaf out? I don’t have that. Or maybe i could replace it with another oil? Hi, thank you for the recipes! I enjoyed looking and reading them all! Can you tell me where you get the container for them? I have a lot of aloe Vera growing, can I use that? Yes, I like to use whole leaf by putting it in my blender and the using what I can and freezing the rest. How could I make this into a sunscreen/insect repellent combo? I know that certain essential oils repel bugs, but I don’t know how they blend with myrrh and carrot seed. They blend fine with myrrh and carrot seed, you just want to be careful not to overload your skin on essential oils. You may decide to add non-nano zinc oxide without the carrot see and myrrh and add bug replant oils instead. Try: citronella, cinnamon leaf (not bark), peppermint, and lemongrass. I ordered 2 versions of you sunscreen, I’ve only used each twice but they both feel great and I’m excited to try them. Thank you for making the recipes available and offering the finished products for sale, is much better to try them first before buying all the ingredients. I also got the light version of your face powder foundation and the color is a perfect match to my skin! You can also use raspberry seed oil. Do you have any tips on making sunscreen a little less greasy? Could I maybe add a bit of arrowroot while melting and mixing the oils; would this help? Yes, You can use 1/4-1/2 tsp arrowroot per 1/2 cup shea butter used. You don’t want to use more because it can really dry out your skin in high quantities. But that little bit can help it feel a bit less oily. I only use shea lotions so now store bought feels like water to me ?. It’s all what you are used to. hello, we were just wondering what the average spf of the beeswax sunscreen would be? I can’t legally give you a specific spf since it hasn’t been analyzed by the American FDA. Without zinc oxide is gives you a mild spf that is very helpful, but not as strong as a 40 or higher. Any time water is added to a recipe it greatly shortens the shelf life. Since this is kept ina sealed container and no hands are touching it, it should last at least a month. Refrigerate for a longer shelf life. You can use another oil like apricot or even olive. Just make sure you use the non-nano zinc oxide. Thank you for your recipes for sunscreen…my son has been battling different hereditary skin cancers for 6 1/2 years and if fair skinned…is there any recipes you recommend best…he can’t be outside much but just want to protect him for the short periods he is. Thank you. Definitely the lotion with non-nano zinc oxide. We will be praying for your son Leslie. Is there an equation that determines spf? Or should i just add the lowest number spf of each ingredient and have that determine the total? And how much would I need of each ingredient – say coconut oil – to reach that spf? The spf really can’t be determined well by adding the numbers. Sorry. I’m fair skinned and the lotion recipe with non-nano zinc oxide is what I have to use and it works really well. The others aren’t enough for me. Hope that helps. can olive oil to replace myrrth essential oil? Hello there! I love your homemade sunscreen but I have a question. My daughter has a severe all types of nuts allergy. I read that shea butter is a type of nut tree that uses it fruit to make oil. Is there other types of butter I can use beside Shea butter? Thanks! We have made your zinc and carrot seed oil sunscreen before and we LOVE it. I’m excited to see all the other options too! You can use any of them and apply as a liquid. Coconut oil lasts longer than other oils like olive oil that will become rancid faster. Hi, is it essential to put the myrrh oil in? It is essential if you do not use zinc oxide. If you are using non-nano zinc oxide then you can get away with not using the myrrh.